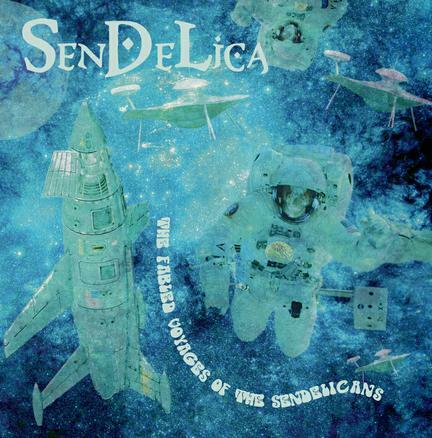 The latest from Welsh Space-Psych-Ambient rockers Sendelica is a compilation album that consists of what the band describe as “long deleted and hard to obtain tracks from our archives.” The set kicks off with the two opening tracks from the 2009 released The Girl From The Future Who Lit Up The Sky With Golden Worlds album. Standing On The Edge is a short, stoned Black Sabbath in space dirge with chanting female vocals, that segues smoothly into Manhole Of The Universe, a 12 minute monster Acid-Space jam. This sucker gets absolutely volcanic. I like the funky Psych-Bluesy mid-section accompanied by freaky voice narration, which soon transitions to a spacey dreamy but still Bluesy segment. The music trips along nicely like Hendrix meets Ax Genrich and Guru Guru, before building up to the final explosion. Next up is Zhyly Blyly, which was the opening track to the 2011 released The Pavilion OF Magic And The Trials Of The Seven Surviving Elohim album. I love the combination of guitar attack and synths on this tune. It’s a powerhouse rocker, but also has deep space Reggae-ish bits as well. Screaming And Streaming Into The Starlit Nite and Carningli (Hill Of Angels) were back-to-back tracks on the 2008 released Streamedelica She Sighed As She Hit Rewind On The Dream Mangler Remote album. The former is an easy paced rocker that creates a basic jamming groove, which lays a foundation for the swinging jazzy lead saxophone. But as this 9 minute track progresses, the band go increasingly deeper into space, until finally the sax eases into the background and killer freaked out guitar takes over. Carningli (Hill Of Angels) is the sole non-heavy track of the set, being a surreal, ambient dreamscape piece with Nik Turner on flute. Finally, we have Spaceman Bubblegum, from the 2007 released Spaceman Bubblegum And Other Weird Tales From The Mercury Mind album. This is an Acid-Space jam rocker with a cool rhythmic groove and tasteful Acid-Blues guitar leads that once again brings to mind Hendrix and Guru Guru. I was already familiar with the music on this album so the attraction for veteran fans would be having some of Sendelica’s hottest heavy tracks on vinyl, and the LP has gorgeous artwork to boot. The album would also be a great introduction to this wonderfully varied band for the uninitiated.